Anyone else loving this yellow color right now!? I feel like it's the perfect fall color that still keeps things bright. This sweater is Chenille which is a huge trend right now- every store I went into this past weekend had Chenille in some form. I can understand why everyone is so obsessed as it's seriously so cozy & soft. 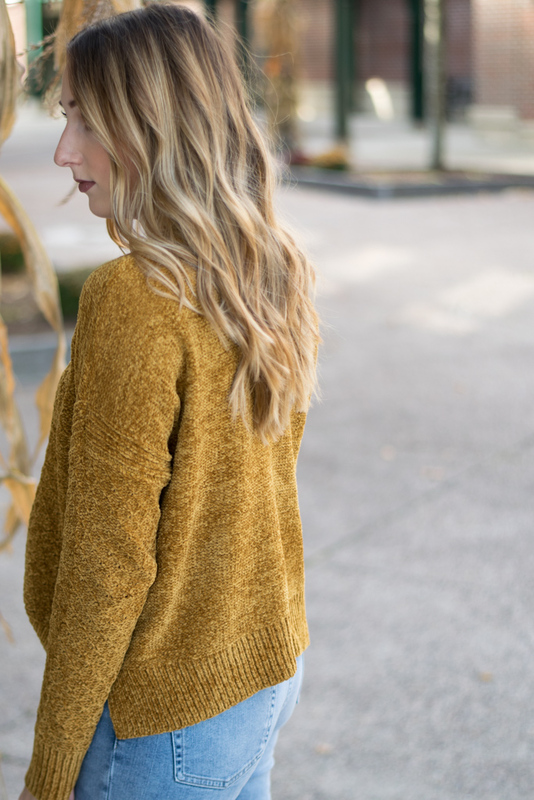 I ended up purchasing this yellow sweater & another blush colored sweater which I'll share later on the blog. Since this trend is new for me I didn't want to splurge on a sweater in this material- this one ended up being under $30 which is such a great deal. I purchased it in an XS as I pictured myself wearing it with high waisted jeans so I didn't want it to be too baggy. I paired the sweater with these "mom jeans" that were under $50 and are now my new fave jeans! I did go up a size in these as I think this brand tends to run a little small. I love finding great staple pieces (like these jeans) at such a steal- you really don't need to spend $200 on denim to have them be great! It's been so warm this fall in Vermont that I've been able to get away with just wearing a sweater & no heavy coat- I'm loving it! I purchased a few more cozy fall sweaters I can't wait to share with you all- most are under $50! This color yellow is one of my favorites for fall! Also, those boots are too cute! That looks so comfy! Also I love this color yellow on you! This sweater is now on my wishlist! I can't believe it's from Target! This is such a great casual fall look. I need a chenille sweater in my life. Love this color on you. This sweater is gorgeous! I love the color on you. I need that sweater! And it's from target! Loooove!!! Alrighty, I need that sweater! Target has so many great yellow pieces right now! Loving that color, especially for fall! This is such a cute look. I agree! Yellow is the perfect fall color! The sweater is so pretty! Chenille has been so popular lately! I need to get my hands on one of these sweaters, they look so cozy!